Co-hosted by BC Children’s Hospital and Island Health September 16-19, 2019 – register here! 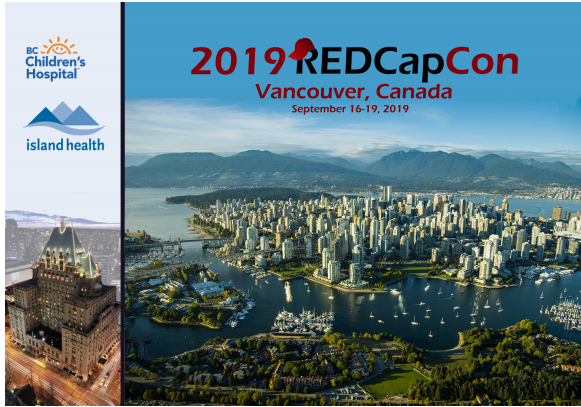 BC Children’s Hospital and Island Health are hosting the 2019 REDCapCon (annual REDCap conference) in Vancouver, BC, Canada on September 16-19, 2019. This is the 11th conference organized by the REDCap Consortium. This three-and-a-half-day event will offer presentations, breakout sessions, and more by REDCap Consortium members. The conference includes a dinner at Fairmont Hotel Vancouver on Monday evening and three full days of programming on Tuesday, Wednesday and Thursday at the Fairmont Hotel Vancouver. Learn more about the history of REDCapCon here. The content of the conference is designed for REDCap Consortium members, that is, REDCap administrative and technical team members who maintain and support REDCap at their own institutions, and who provide global support of REDCap through consortium efforts. The conference is NOT designed for end-users (researchers, etc.) of the software. The Early Bird registration fee this year is $550USD**, and the regular registration fee $600USD**. The registration fee covers: kickoff night dinner, breakfasts, lunches and snacks for the event duration. **The registration fee will be set firm in Canadian Dollars at the time of registration opening. As the currency exchange rates fluctuate, so will the USD amount paid. Kickoff Dinner on Monday evening September 16th! Details will continue to change as programming develops. Conference and accommodations will be at the Fairmont Hotel Vancouver, located at 900 West Georgia Street, Vancouver, BC, V6C 2W6, Canada. The Fairmont Hotel Vancouver, BC is a landmark hotel located in downtown Vancouver. The hotel is known as the ‘Castle in the City’ and reflects timeless luxury and history of Vancouver. Fairmont Hotel Vancouver is minutes from Vancouver’s biggest attractions, including Granville Island, Robson Street shopping, Stanley Park Seawall, Vancouver aquarium, Gastown, Canada Place and Science World. Fairmont Hotel Vancouver is offering a discounted sleeping room rate to 2019 REDCapCon attendees for as low as $299 CAD (approximately $225 US) per night for double rooms. The discounted rate is eligible for September 13-22, 2019. Room quantities are limited, so please book early. A variety of parking options at Fairmont Hotel Vancouver are available for your convenience such as overnight self-parking, VIP Valet Parking and Assisted Valet Parking. More information about parking here. There are a number of ways to get to Vancouver, we’ve listed the airports below. Vancouver International Airport is the easiest and closest, however some may opt to fly to Seattle, WA, and come to Vancouver via shuttle, rental car, or train. For more information, visit https://www.tourismvancouver.com/plan-your-trip/getting-here/. Directions: See https://www.fairmont.com/hotel-vancouver/map/map-and-directions/ for directions to the hotel from Vancouver International Airport. From Vancouver International airport, you can easily take the Canada Line Skytrain that takes you 2 blocks from the hotel. The link above also includes directions from the USA/Canada Border, from Highway 1, from various ferry terminals, or from Whistler. Directions: Another option to get to Vancouver is to fly to Seattle and take the shuttle bus which provides transportation from Seattle airport directly to Vancouver hotels downtown (4.5 hrs, Quick Shuttle, http://www.quickcoach.com/), or the train (4 hrs, Amtrak, https://www.amtrak.com/home.html), or rent a car. Things to Do in Vancouver and Victoria! Victoria: check out https://www.tourismvictoria.com/ for what to do in a day on the Island. Please direct general inquiries about the 2019 REDCapCon, including programming inquiries, to redcap@vanderbilt.edu. For questions about registration, contact Halley Cote, redcapcon@bcchr.ca, @halley.cote (Community Site).